Bulk of the increase in overseas investment and hiring by U.S. multinationals has been in the service sector where most of the American middle class jobs have been lost. 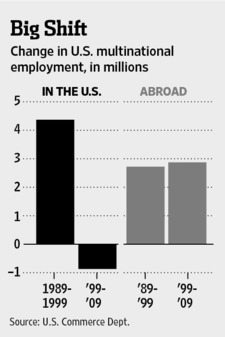 Among U.S. multinational firms in manufacturing, about 60% of employment is still in the U.S. But the manufacturers cut their U.S. payrolls by 2.1 million in the 2000s and added 230,000 workers overseas. While the U.S. multinational manufacturers employ 6.9 million workers in the U.S. and 4.6 million abroad as of 2009, the trend clearly indicates the balance shifting in favor of overseas jobs at the expense of jobs in America. The irony of it is that the vast majority of average citizens of nations like India where jobs have been created by American corporations have not benefited either. After the decade of job creation by US multi-nationals, India still remains home to the world's largest population of poor, hungry and illiterates. Bulk of the benefits of globalization have gone to a few dozen powerful Indian oligarchs in "the world's largest democracy". Looking at this jobs data, it's clear to me that the foolish and short-sighted actions of the American MNCs are undermining the very system that has nurtured and enriched them by creating middle class American consumers and voters whose jobs they are killing. It's the middle class America that has supported the system of American democracy and free markets; destroying middle class America by taking their jobs overseas will only lead to rising instability that will threaten the very foundations of this system....the growing "Occupy" movement across major American cities and university campuses is only the tip of the iceberg of rising discontent. It's time to save democracy and capitalism from the American capitalists! Firsty, as you have dedicated your last 3-4 years to establish the obvious - a large chunk of indian population is poor. Mpi puts it at about 54 percent, which roughly translates into about 500 million. If that is the case, how is it 'ironic' that half a million jobs didnt benefit half a BILLION people?! Secondly, whats ironic is your unsolicited commentary on poverty in india, when clearly on most undp indices and sub indices pak again lags behind india. For instance, despite your tall claims of hunger in india, all un bodies, without exception, show that undernourishment is higher in pak. Thirdly, the jibes at democracy in india do appear legitimate given our track record. But certainly not from pak. Certainly not while memogate is playing out. Certainly not from a country where military coups have been the norm, and elections the exception. Certainly not from country that has lawlessness in not just frontier but running wild in the 'largest city in the world' - karachi. Certainly not while pak rangers engage in ethnic cleansing in balochistan. Ever heard of the house of glass? Fourthly, to juxtapose any development in india against the OBVIOUS poverty, and then to dismiss it, is a useful trick if ur trying to con 8 year olds. While it is sad that poverty exists, it is also true that india has achieved a lot from aircraft carriers to the first and only formula 1 race of the subcontinent - things that pak knows none of. Another irony is that while you are comfortably parked in the comforts of the silicon valley, you speak of of how pak is better to live in as compared to india. The funny part is u've been selling 'pak shinnnig' at india's expense, but judging from comments to ur blog, other than the occasional 'riaz bhai', no one seems to be buying it. Why don't you put your money where your mouth is!? And instead of quoting william darymple, why don't you make a move to say gun slinging karachi, or the law less nwfp, or better yet a stay at an ethnicaly cleansed balochistan? Maybe then you could hope to enjoy some credibility. the jobs are created in India to save money and improve profits. One more benefit is Indians are more competetive and efficient at work, comapred to their neighbours. Even China had become a 5 day week country. Only in India, we are working 6 day week. Also the people here dont take frequent breaks for prayers. they are professionals at work. There are more than 200,000 americans working in India. Mostly at top positions. Its usually win-win. I dont think America is bleeding. India remains home to the largest amount of poor and hungry, you say. If you dont work, you go hungry. Simple rule. If you have more kids, then u will not have enough food. I know of a mullah in my city with 11 kids. This days it is expensive for even one kid. let alone 11. Not anybody's fault except his. All western MNCs are outsourcing but the middle class is not dying in scandinavia,Germany and other European countries. 1.An idiotic tax system skewed to favour the top 1%.Warren Buffet pays less tax than his secretary. In scandinavia the rich get taxed 70%. 2.Lack of educational opportunity due to unaffordable engineering, medical and other professional education for all but the most brilliant who get scholarships.In scandinavia education is FREE and entry is on your entrance exam scores only.No alumi babies,no extra curriculars etc just one tough national exam. 3. Very poor training for the bottom 50% of the population.In Germany the blue collar worker has apprenticeship and a rigorous skills program and earns a good salary,nothing similar in the US. 4. Financialization of the economy. It is completely unfair to blame MNCs for going to other places for talent if the price/benefit calculus is more favourable. Why shouldn't they turn to Indians to write basic code for applications when the labour costs are 1/10 ? Why not get shirts made in China if they caan be made at 1/20 the price? It does not need a mob lynching of world class companies like GE,Pratt and Whitney,Boeing,Apple etc for making quality products the whole world wants and respects US for. Multinationals have no loyalties. If the American middle class shrinks, they will simply find consumers elsewhere. Anon: "Multinationals have no loyalties. If the American middle class shrinks, they will simply find consumers elsewhere." That's true, although the pace of such change and the preferences of consumers in other nations are questionable. And if the process shakes up the foundations of the US system the rest of the world is copying, then there could be yet another global financial crisis spelling doom for US style capitalism and democracy. Erik Brynjolfsson: IBM's deep QA system that plays "Jeopardy," we had a contest here that played against our best MIT students, the best Harvard students we could put it up against. And not surprisingly, Watson won. And it's being used in real practical applications now on Wall Street and in call centers. Siri -- millions of people are using that every day. Andrew McAfee: The fact that computers can now understand and respond to human speech, the fact that they can actually generate prose of decent quality, they can drive cars, they can win at Jeopardy. We're seeing technology demonstrate skills that it's never, ever done before. Rodney Brooks: If you're using robots to compete with a simple task that a low-paid worker does in a foreign country you can bring it back here and do that task here. Steve Kroft: Baxter costs 22 grand? Steve Kroft: How long does he last? Rodney Brooks: It lasts three years. Rodney Brooks: So you can think that as 6,500 hours. Steve Kroft: I think it works out to about $3.40 an hour? Rodney Brooks: About that yeah. Steve Kroft: $3.40, that's probably the wages of the Chinese worker, right? Well I certainly noticed that. I called several customer service, Cisco, Time Warner, Dell, etc and I'm always speaking with an Indian guy! I always wondered why they have to outsource services when there are lots of jobless Americans. What's good about US is that they always ask for India and China's assistance when it comes to the BPO industry. I believe some of the inbound call center software are even provided by US companies who need BPO assistance.